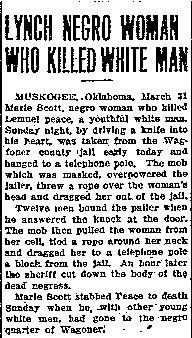 Killed March 31st, 1914, near Muskogee, Oklahoma. Scott was removed from jail and lynched in the street nearby. No evidence was offered of resistance on the part of the jailer. No arrests were made, nor were any officers disciplined for failing to protect their prisoner.